Once, an old lady, completely bent at right angles at her waist came in. 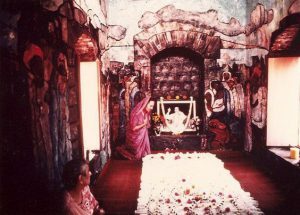 She would put her hand on her forehead to avoid the glare on her eyes so that she could see Baba in the crypt. When asked whether she could see Baba, she just shook her head in the negative. She seemed to have got hypermature cataracts in both eyes! She was led to the landing of the crypt and only after she had sat down there and a torch light focussed on Baba’s face, could she see Him. It was then that Eruch told us that she was Valu, an old and faithful devotee of Baba from the early twenties. She was very dear to Baba and though she could not see Baba well, Baba saw her and acknowledged her long, sincere, unselfish and loving services for the Avatar of the Age. Tears came into her eyes as she remembered the years she had spent with Baba. They were tears of love. Who cries for else, he does but jest.